Ok, this might sound totally unnecessary since everyone using IDEA is supposed to be an uber geek, but I think it would be nice if you added a start menu entry "IntelliJ IDEA (No extensions)" which would start IDEA w/o any of the user-added extensions. You could go further and have "IntelliJ IDEA (Safe Mode)" which starts up with no extensions and doesn't automatically load the last workspace (if they have Reopenn last project on startup checked). 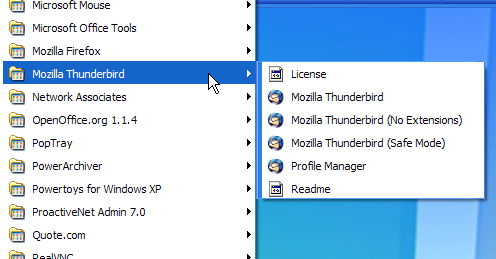 See attached pictures of how Mozilla Firefox and Thunderbird do it. +1 Safe mode is a good idea (no pun intended). Add IntelliJ IDEA (No Plugins) Start Menu entry ala Firefox/Thunderbird/etc. Perhaps the installer should list all the default plugins that IDEA will install, with corresponding checkboxes, and you can choose the ones you want (instead of deleting them later). If you run the installer again, it detects that IDEA is already installed, and lets you either uninstall it or choose default plugins to add or remove.